For the record: There could easily have been a post on say 'Reasons to Love HP P4000 iSCSI SANs' – with their ease of clustering, 'Reasons to Love 3PAR' – with 3PARs excellent "stay-thin" and "Peer Motion" technologies, ... and the list goes on – vendor agnosticism and open-mindedness are fantastic traits to have. 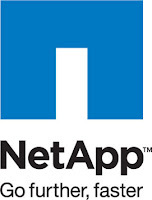 An important part of being able to sell a product – either internally to your own company, or externally to a customer – is that you are passionate about what you are trying to sell; so this post attempts to put down in text some ammunition for answering the question – "Why NetApp?" NetApp's strategy is pure play storage. Storage is what they do and that single focus helps them to excel at what they do – make excellent highly-featured storage. The same operating/management system – Data ONTAP – applies to the complete range of FAS series devices, from the FAS2000 series at the small to medium enterprise end of the market, through the FAS3000 series, and up to the enterprise level FAS6000 series. Also, Data ONTAP is much more open in terms of accessing the underlying operating system CLI than other rivals offerings, which is excellent for techies. NetApp are great innovators: from WAFL (1992), through Snapshot technology (1993), NDMP (1996), SnapRestore (1999), SnapManager (2000), MultiStore (2001), NearStore (2002), SnapLock (2002), SnapVault (2002), V-Series (2003), RAID-DP (2003), FlexVol thin provisioning (2004), MetroCluster (2005), Unified Deduplication (2007), Performance Acceleration Module (PAM) (2008), to NetApp Data Motion technology (2010) and much more. See: http://communities.netapp.com , YouTube, and various blogs. NetApp have a fantastically large and thriving community of enthusiasts, geeks, bloggers, YouTube film makers, storage administors and architects. This point comes from various sources, especially NetApp TV and NetApp's highly informative website. Of course all good companies out there are doing (or at least trying to do) the same – hey, needed something to get me to number 7! Check out http://www.netapp.com/products/ for the complete listing. 7-Mode: allows FAS arrays to be deployed as a local two-node cluster, a geographically spanned MetroCluster, and as a remote distributed FlexCache. Cluster-Mode: expands a NetApp storage cluster from 2 nodes to 24 nodes, increases the features found in 7-mode to include endless scaling, global name spaces, and the complete separation of data and data access from the hardware layer in the form of next generation vFilers. Note: It is not possible to change from one mode to the other without a rebuild – check out netapp.com for the limitations of a particular mode. *Some of the features may not be available for all models. Data Motion – Always-on data mobility. Perform live data movement without the need for planned downtime. NetApp has long been considered one of the most innovative products developed to provide companies around the world with the best IT solutions. It can deliver maximum data protection and performance on your server. One particularly useful program from NetApp is SnapRestore. This software is capable of using backup copies called Snapshots to recover file systems or data volumes consisting of any number of files in just a matter of seconds. This is particularly useful for storing large amounts of sensitive information in order to prevent complete data loss. Ho comprato un orologio per il mio ragazzo in questo negozio online.orologi repliche italia L'orologio funziona in tempo, la qualità è molto buona,repliche omega seamaster orologi lo stile dell'orologio è molto simile, vale la pena acquistarlo.